Does this Moon look a little different to you? 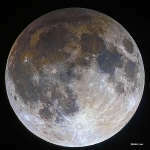 Although shown in spectacular detail, the full face of Earth's most familiar satellite appears slightly darker than usual, in particular on the upper left, because it is undergoing a penumbral lunar eclipse. Sometimes, stars form in walls -- bright walls of interstellar gas. In this vivid skyscape, stars are forming in the W-shaped ridge of emission known as the Cygnus Wall. Part of a larger emission nebula with a distinctive outline popularly called The North America Nebula, the cosmic ridge spans about 20 light-years. Which way is the wind blowing? The featured map can tell you this and much more, no matter your location on planet Earth. The dynamic map displays supercomputer forecasts drawn from multiple sources of global satellite data updated every three hours. Ninety percent of the houses on Grenada were damaged by the destructive force of Hurricane Ivan. At its peak in 2004, Ivan was a Category 5 hurricane, the highest power category on the Saffir-Simpson Scale, and created sustained winds in excess of 200 kilometers per hour. 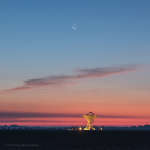 Sharing dawn's twilight with the Moon on September 29, Mercury was about as far from the Sun as it can wander, the innermost planet close to its maximum elongation in planet Earth's skies. Gorgeous spiral galaxy M33 seems to have more than its fair share of glowing hydrogen gas. A prominent member of the local group of galaxies, M33 is also known as the Triangulum Galaxy and lies about 3 million light-years distant. What is this unusual mound on Mars? NASA's Curiosity rover rolling across Mars has come across a group of these mounds that NASA has labelled Murray Buttes. Pictured is a recently assembled mosaic image of one of the last of the buttes passed by Curiosity on its way up Mt.